Uprated presure plate for added grab. When the power goes up so does the chance of clutch slippage. 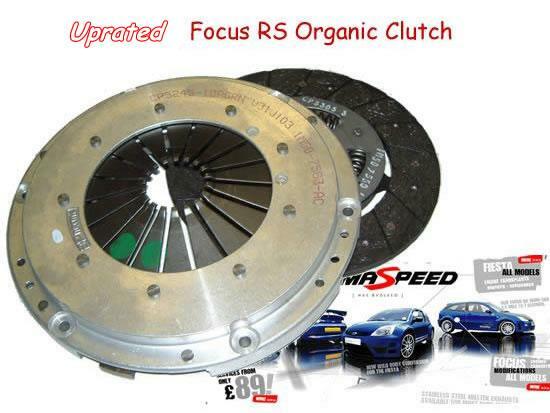 For power close to and over 300bhp this uprated organic clutch will retain the smooth operation and feel of the std clutch but will give the added bite from its harder presure plate. If the paddle clutch is too aggressive then this is the next best thing, perfect for the trip to the shops or those quick get aways down the drag strip. suitable for power to 350 bhp maximum !! The Pumaspeed Workshop team are ready to fit the Focus RS Mk1 AP Racing Organic Clutch Kit Uprated in our Head Office located here. Therefore making parts and labour a total cost £1,328.99 (inc. VAT). Pumaspeed have a specialist distribution team that can dispatch the Focus RS Mk1 AP Racing Organic Clutch Kit Uprated to any destination worldwide.